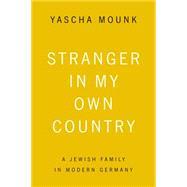 As a Jew in postwar Germany, Yascha Mounk felt like a foreigner in his own country. When he mentioned that he is Jewish, some made anti-Semitic jokes or talked about the superiority of the Aryan race. Others, sincerely hoping to atone for the country's past, fawned over him with a forced friendliness he found just as alienating. Vivid and fascinating, Stranger in My Own Country traces the contours of Jewish life in a country still struggling with the legacy of the Third Reich and portrays those who, inevitably, continue to live in its shadow. Marshaling an extraordinary range of material into a lively narrative, Mounk surveys his countrymen's responses to "the Jewish question." Examining history, the story of his family, and his own childhood, he shows that anti-Semitism and far-right extremism have long coexisted with self-conscious philo-Semitism in postwar Germany. But of late a new kind of resentment against Jews has come out in the open. Unnoticed by much of the outside world, the desire for a "finish line" that would spell a definitive end to the country's obsession with the past is feeding an emphasis on German victimhood. Mounk shows how, from the government's pursuit of a less "apologetic" foreign policy to the way the country's idea of the Volk makes life difficult for its immigrant communities, a troubled nationalism is shaping Germany's future. Yascha Mounk is a PhD candidate in political thought in the Department of Government at Harvard University and is the founding editor of The Utopian. He frequently writes for newspapers and magazines, including The New York Times, The Wall Street Journal, the International Herald Tribune, The Nation, Slate, and Die Zeit.